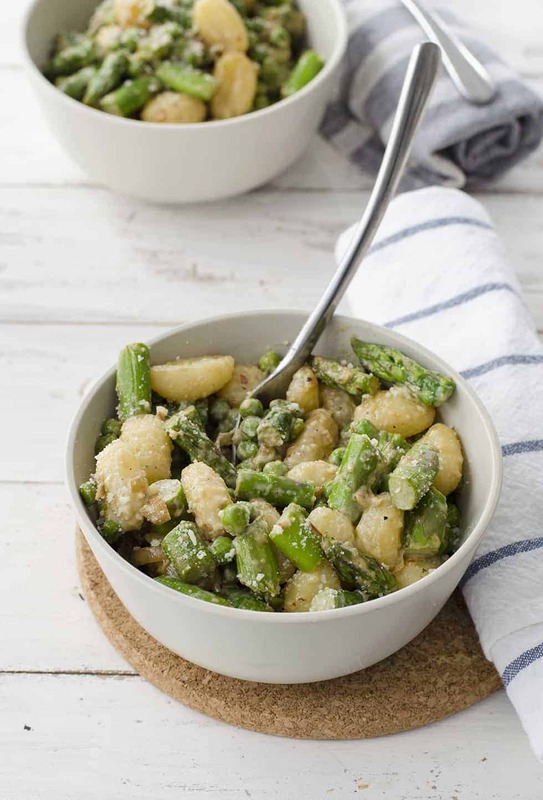 Spring Vegetable Gnocchi! 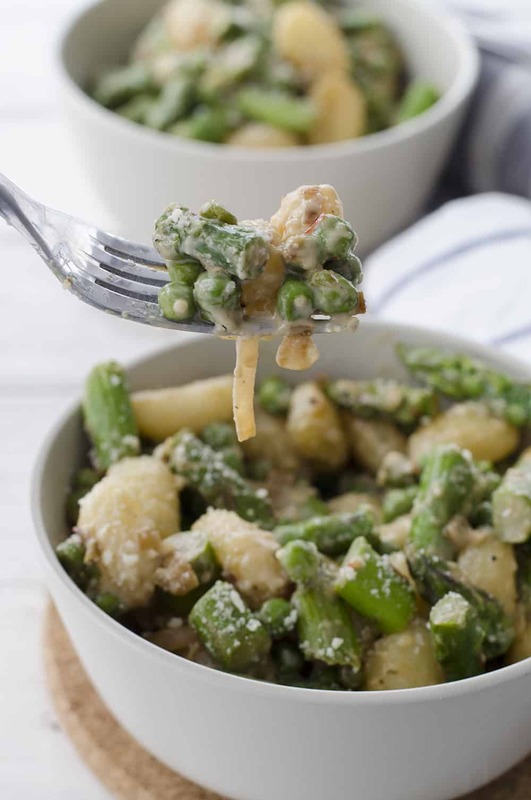 Peas and asparagus in a light cream sauce and gnocchi. This dinner is the perfect way to welcome back spring. 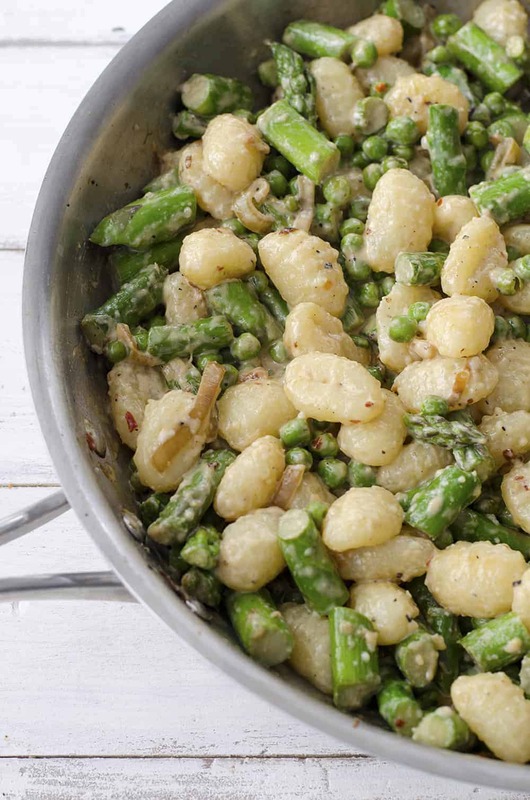 Fresh, crisp asparagus spears with bright peas in a light cream sauce with pillowy gnocchi. I’ve made this one twice in the last week and it’s been a hit each time. First, with just BL and I and then again last night for our Easter dinner with his parents. When my father-in-law goes back for a forth serving, you know this one’s a keeper. This gnocchi recipe is a slightly different version of one of my favorite recipes in my upcoming cookbook, Fresh Italian Cooking. While that dish celebrates summer with fresh corn and zucchini, I’m giving this one a springtime touch with shallots, asparagus and peas. It’s so, so good. Even though this recipe plans on serving four, BL and I polished off the entire pan over the course of the afternoon. 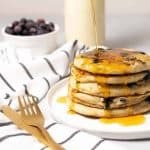 For my dairy-free and vegan friends, this one is easily adaptable. Try it with my homemade parmesan cheese (or any store-bought version) and cashew cream. Whatever version you end of making, I think you are going to love this one. 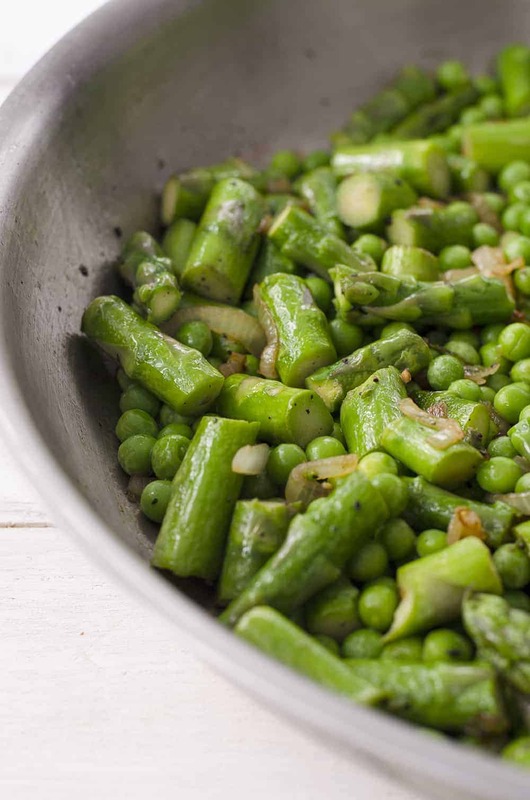 It’s ready in just 30 minutes, a perfect spring-time dinner. While roasted asparagus is my favorite side dish, I opted for a stove-top saute for faster prep time. Decked out with lemon, red pepper flakes and a light shaving of Parmesan, it’s simple yet full of flavor. Bring a large pot of salted water to a boil. Add the gnocchi and cook until done according to package directions. Drain and lightly rinse with water. Set aside. Add the olive oil, shallots and pinch of salt and pepper. Cook for 2-3 minutes until shallots are slightly soft. Add the asparagus and cook for 8-10 minutes until asparagus is fork tender. Add in the peas and cooked gnocchi, cooking for another 2-3 minutes until peas are heated through. Remove from heat and sprinkle in parmesan cheese, cream and lemon juice. Stir to combine and add crushed red pepper flakes, if desired. For the parmesan cheese- I rely on my homemade cheese, a combination of almonds, cashews, nutritional yeast and garlic powder. You can find the recipe here. For the heavy cream, I use cashew cream, which is a blend of cashews and water together that creates a consistency similar to cream. Gnocchi will always be one of my favorites! So beautiful for spring! they do look soon pillowy/soft/comforting. 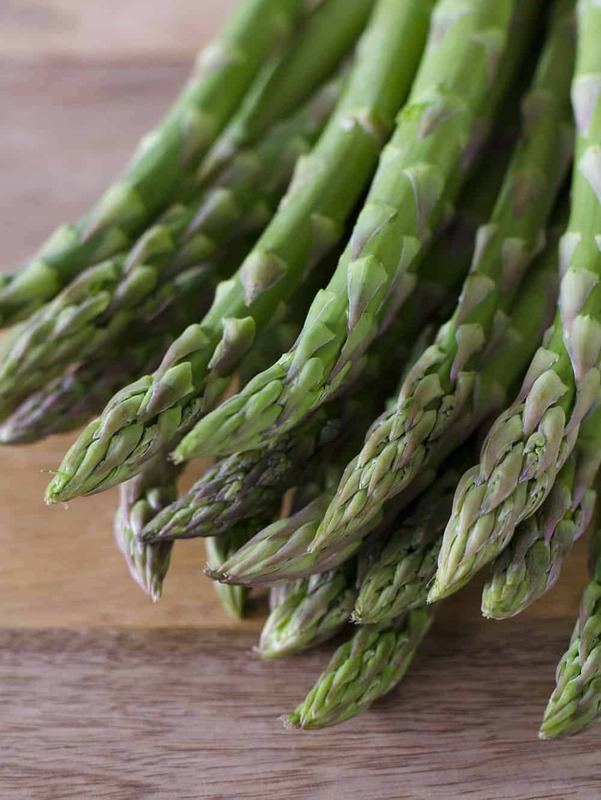 this time of the year, asparagus is soon good, love everything about this dish! Oh! I bet this would be awesome with homemade gnocchi! This looks SO good, I would love to have this for dinner, pinning for later and sharing! Where is the vegan non dairy version? Just made this dish……easy, fresh, and oh my goodness so yummy!!! Thank you so much! An easy, healthyish 🙂 meal….could easily add a few different things to,change it up a bit. But definitely a keeper!!! Hi Laura, thanks so much for the comment! Glad you liked it! 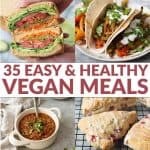 WHere are the notes for the vegan version? I made this recipe last night for the second time since stumbling upon it. There are no words to describe how delicious it is! The only alteration I made to the recipe was to chop up a small package of brussels sprouts and add them in to cook at the same time as the asparagus…just so I would have more of the dish to enjoy 🙂 This recipe is just so good and really easy to make. I think it even converted my non-veggie loving boyfriend, who was the one to ask me to make it again! Hi Lee- so glad that you liked it! Thanks for the comment. This is a lovely recipe and I will for sure will make it again . I made a vegan version of if last night and it was just what I needed. I also added a handful of spinach just to give even more vibrant green colour to the dish. I also had it for lunch and it was nice, but like with many dishes, it tastes the best when served right away. I was wanting to make a vegan version as well, but was hoping to find an alternative to making the cashew cream she mentions in her notes. What did you use for the cream? Hi Angela- if you don’t want to use cashew cream, what about a ready-prepared vegan creamer like a soy creamer or an almond cream? As long as it’s unsweetened, it should work. Hi Barbara- you are welcome to share my link! Thanks! made this for dinner tonight. absolutely delicious! I’ve been going through your recipes and printing lots. next up is the Buddha bowl for my work lunches this week. So glad I found your website!